Take big pants - when I was buying the bits for my bag I made sure I purchased a 6 pack of cheap, massive granny knickers. These are essential for some many reasons! If you have a c-section you want some pants that won’t touch your wound so pants that come up high are a must. As I said before, you will bleed after birth so you want pants that have a big gusset so therefore are easy to wack maternity pads into and pants that you don’t mind getting ruined. The other key thing is that you want to be comfortable. The thought of having to fish a thong or some lace out of my postpartum bum makes me shudder! Forget style and work with comfort. No one cares if you have VPL for a while whilst you get your lady garden back to some kind of normality. Pain killers- this is an odd one as going into hospital you wouldn’t think that you’d need to take pain killers but I would definitely recommend popping some into your bag. I took some paracetamol and ibuprofen in my bad when I had Pickle and I was so glad I did. The midwifes in the postnatal ward can sometimes be really busy and it was so much easier to be able to keep myself topped up on pain relief rather than have to pester the midwives every couple of hours. A spare t-shirt for your husband/partner - trust me on this one...by the time Pickle was an hour old, hubby had already gone through two t-shirts. I have vomited on him and pickled had pooped on him. It doesn’t take much to chuck a couple of extra t-shirts in and it’s something you don’t necessarily think about but it’s certainly worth doing. Pack in an order - if your husband is anything like mine then he can’t find his nose when it’s on his face. Pack strategically! Think about the things you will need in labour and pack those at the top, leaving things you’ll need after the birth further down the bottom. 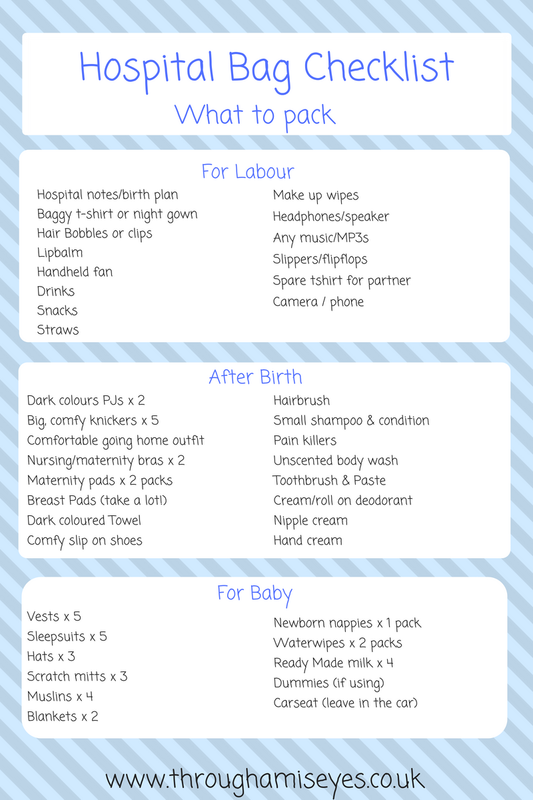 Also pack things that you will know you’ll need your partner/husband to get in an obviously place. I’ve made sure my hair bands and charging leads are in a very specific place so if we need them I can tell hubby exactly where they are rather than him having to hunt through the bag. Think practical - yes the cute set of dungarees with the matching hat looks super cute and would adorable in your going home pictures BUT they are not practical! You are going to have a wiggly little newborn that you are going to be terrified of dressing as you won’t want to hurt them so babygrows are a must! I would also recommend getting the simple, button up at the front babygrows as ones that go over their heads are a PAIN!! Especially if they poo or are sick over them! Take pre made formula with you - now this is a bit of a controversial one but I would honestly recommend popping some little bottles of ready made formula in the bag. When we had Pickle he was poorly and because of the stress I found it pretty traumatic to try and breastfeed him. Luckily I had taken formula with me so it meant hubby didn’t have to run out and get any but I saw many women in the ward who didn’t take any. Their partners had to frantically dash to Tesco’s or Boots to grab some and if you just pack a couple then at least you won’t have to worry. If you don’t use them then it’s fine! Don’t bother packing teddies - you won’t use them, if you put them in the little fish bowl cot then they will probably get covered in sick and they are just a waste of space in your bag. Save them until you get home.